The Caribbean Sea is home to some of the most exotic and exciting vacation destinations on Earth. With diverse wildlife, stunning landscapes, unique cuisine, warm tropical waters, and breathtaking beaches, Caribbean islands and nations have so much to offer to every kind of visitor, regardless of age or background. The only problem with planning a Caribbean vacation is trying to choose which island to visit first, and that's why many people choose to reserve themselves a spot on a Caribbean cruise and visit multiple islands in one trip. Whether you're planning a cruise or a simple getaway, one Caribbean island stands out as an excellent option: Grand Cayman. Grand Cayman is the biggest of the three Cayman Islands, which are located in the western part of the Caribbean Sea. The Cayman Islands form a British Overseas Territory, meaning that English is the official language here, and Grand Cayman is the best one to visit if you're looking to soak up some local culture. The Cayman Islands' capital city of George Town is found on Grand Cayman, and the island is also home to all kinds of astonishing wildlife and wilderness, just waiting to be explored. It's a beach-lover's paradise too, with a long coastline and some of the finest beaches in the whole Caribbean. Grand Cayman beaches are especially well-suited for activities like scuba diving and snorkeling due to the many coral reefs in the area, but they're equally idyllic locations to simply sit back with a good book and relax as the warm sunrays beat down. In short, these beaches can suit every kind of visitor and will make you swiftly fall in love with the island and want to come back time and time again in the future. Read on to learn all about the various activities, amenities, and features of the best beaches on Grand Cayman island. Seven Mile Beach is the main beach spot in Grand Cayman. Despite the name, this beach actually only runs for around five and a half miles in length and can actually be broken down into lots of smaller, individually-named areas which each offer their own advantages and amenities. 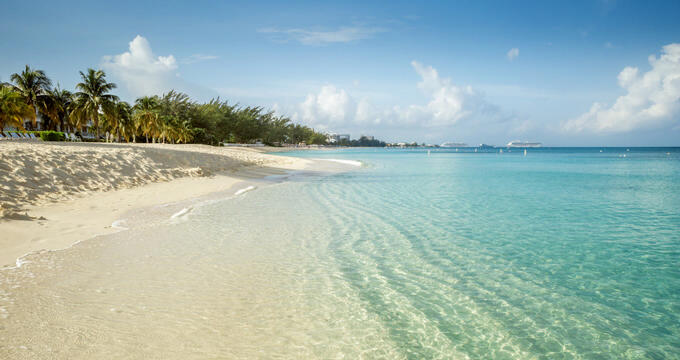 Seven Mile Beach has been ranked as the best beach on the planet by travel experts on multiple occasions, so it's an unmissable part of any Grand Cayman vacation. The entirety of this beach is open to the public down to the water's edge, but it's important to read up on the best parts of Seven Mile Beach and find the right one for you. This beach has a simple name but is far from basic. It's located on Seven Mile Beach and is probably the most popular spot in the whole area, especially with families. If you're traveling with children of any age, you really cannot afford to miss out on Public Beach. The area is equipped with tons of attractions including play areas, trampolines, slides, climb walls, and more. Kids can spend hours here having non-stop fun, and grown-ups will find a lot to love about Public Beach too, with the soft sands and warm waters providing nice conditions for swimming and sunbathing sessions. Cemetery Beach is also located on Seven Mile Beach and is the best spot in the area to head off into the water and look down beneath the waves. Snorkeling is simply exceptional here, with countless colorful fish swimming about off the shore and just waiting to be discovered and admired. So if you're a snorkeling enthusiast or looking to try out this activity for the first time, this is the best snorkeling beach in all of the Cayman Islands. It can be found at the far northern part of Seven Mile Beach and never gets very busy or crowded. If you're looking for a beach on Grand Cayman away from the crowds and tourism of Seven Mile Beach, head on down to Spott’s Public Beach. It's located on the southern shore of the island, not too far east of George Town, and never gets busy. In fact, you can have the whole place to yourself if you visit on a weekday at the right times. There's a pretty little dock here and some imposing cliffs at either end to provide a cozy, romantic atmosphere. This beach is also popular with some non-human guests; lots of sea turtles can be seen coming ashore at Spott's Beach, so it's a lovely place to visit to do some wildlife watching. Barefoot Beach is found over on the eastern side of the island, which is far less populated and touristic than the western area near George Town. Therefore, this is a good beach to visit if you're looking to head off the beaten path and find something new and different, with Barefoot Beach being one of the most pristine spots on the entire Cayman Islands coastline. Good snorkeling and swimming spaces can be found at this beach and there are some charming local bars and restaurants to be found in the nearby towns.